What else to see in Iran? | Snowboard and ski in Dizin, Iran! What else to see in Iran? My first suggestion definitevely has to be Yazd. It is the oldest city in the world that is still inhabitated. Walking through the narrow streets between old mud houses is like stepping back two thousands years in time. Some of these houses hide beautiful gardens with pools and rooms enough for a king behind their tall walls. In addition there are some fantastic mosques here. A beautiful hill-side village where the houses are built so close together in the steep hill that the house-roofs are used as roads. A popular getaway for Tehranians who wants to escape the heat and enjoy a hike in the mountain. Rent a room from one of the villagers and enjoy a kebab in the small bazaar. Also visit nearby Qaleh-Rudkhan, an old hill-top fort. 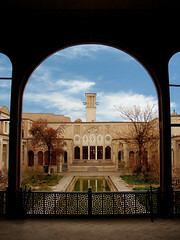 If you have limited time then a trip to Kashan is the best choice. 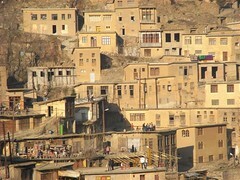 Only a couple of hours south of Tehran you can see beatiuful old buildings and a great active bazaar. A perfect place to see a real Iranian small city, you will not find many tourists here and the bazaar is operated the same way it always has. Nearby you will also find Fin Garden. For a day-trip from here visit a small mountain village called Abyaneh famous for beautiful red mud houses and women with colorful scarfs. On the way back to Tehran stop in Qom, the religious center of Iran where you will find conservative muslims. 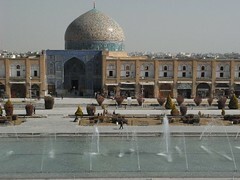 Holds perhaps one of the beautiful man made places in the world: Naqsh-e Jahan Square (after the revolution officially known as Imam Khomeini Square). 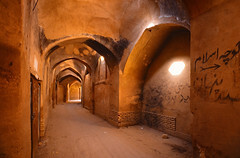 Also take a stroll over one of the bridges and a stop for a relaxing chai while chatting with the locals. Been to Iran? What are your favorite places? Leave a comment.